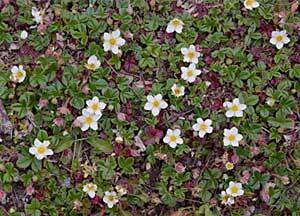 A spreading evergreen groundcover to 5″ tall. Three leathery leaflets, the middle tooth being shorter. 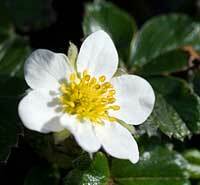 White flowers with yellow centers are followed by small red hairy strawberries. Found on sand dunes and sea bluffs. 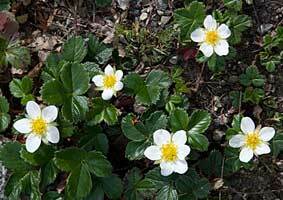 leaves are larger in richer soil. Native to the west coast from Alaska to California.